PULEET Notification 2019: The higher officials of the Panjab University, Chandigarh will release the PULEET 2019 Notification on their official site. And also, candidates who are interested to attempt the Panjab University Conducts Lateral Engineering Entrance Test (PULEET) need to apply online from 19th May 2019. This is to provide admission into second year B. Tech in Panjab University, Chandigarh. So, candidates who have a three-year diploma degree is eligible to apply for this PULEET Notification 2019. And, the last date of submission of the online application form is 26th June 2019. So, we suggest the aspirants apply before the closing date of the notification. In this article, we are providing you with the complete information regarding exam dates, online application form details, apply links, application fee, steps to apply for the notification, etc. Furthermore, for the latest information regarding PULEET 2019 keep browsing this article. PULEET Notification 2019 is available in this article. Aspirants those who are eligible and also willing to attend PULEET 2019 can start applying for the notification. The notification will be available on the official web portal of Panjab University @ puchd.ac.in. Moreover, we are clearly explaining about the notification in this article. So, every individual who is willing to apply for the notification can check out this whole article. And, as mentioned earlier, the closing date of the online application form is on 26th June 2019. Also, the last date for submission of Application fee is on 29th June 2019. We will notify with the latest updates regarding any changes in the dates. Before going further to Submit the PULEET 2019 Application Form, try to check the above table. It has almost, total data related to the PULEET 2019. Thus, you will get the overall idea of this Exam. So, that table has information such as the Name of the Exam, Name of the Organization or the University that is conducting this Panjab University Lateral Engineering Entrance Test. Age Limit: The minimum age limit is 17 years of age to apply for the entrance exam. There is no upper limit for a candidate to give the exam. Number of Attempts/ Residential Criteria: There is no bonding to a candidate’s residential criteria or the number of attempts. However, there are a few reservation criteria’s for candidates residing in different regions. Academic Qualifications: Candidates should have passed diploma in engineering for minimum 3 years after matriculation with physics and Mathematics from Polytechnic College/ Institute recognized by UGC/ AICTE or Affiliated to the state board to technical education. Candidates must have obtained 60% as an aggregate in their diploma course. 5% relaxation is for SC/ ST/ PWD category Students. Candidate must have passed diploma in the engineering of minimum 2-year duration after 10+2 from Polytechnic College/Institute recognized by UGC/ AICTE or Affiliated to the state board to technical education. The management of Panjab University will release the PULEET Notification 2019 on 19th May 2019. And, the online application forms are accepted now. So, aspirants who are willing to apply for the notification can start applying immediately. Moreover, the last date of the submission of the application form is on 26th June 2019. Aspirants those who do not submit their application form before the last date will be rejected. Therefore, we advise all the candidates to apply before the last date. Also, the higher officials have kept a deadline to pay the application fee that is on 29th June 2019 at 4.00 P.M. And, the candidates have to pay the application fee in the given due of time. In this section check the overall details about PULEET Online Application Form 2019 Details. And, also you can pay the application fee in the bank in the name of University and submit it. Do not forget to download the pay slip. Also, the aspirants who are sending the application fee to the University through speed post can on or before 7th July 2019. So, we suggest all the candidates visit the official web portal of Aliah University @ aliah.ac.in before applying for the AUAT Notification 2019. For, more queries keep reading this article. Download your Bank Slip after submitting the online application form. After taking a print out, Submit the fee at any branch of State Bank of India. Finally check branch code, journal number and fee deposit date as provided by the bank. Make sure to check the application fee status from your registered ID. First, visit the official web portal of the Panjab University, Chandigarh @ puchd.ac.in. Check for the PULEET Notification 2019 link. Read the instructions and guidelines carefully. Nextly, fill the empty particulars with appropriate data. Application Fee has to be paid through Net Banking/ Credit Card/ Debit Card. Upload your photograph and Signature based on the size that they demand. The size of the image should not be less or more than that mentioned in the instructions. Use the blue pen or black pen on a white paper for signature. After this process, the registration id will be sent to the registered mail. After this, submit the physical documents through the online gateway that is present on the official website. Take a copy of the application and keep it safe for further use. We hope that the information that we are providing you is helpful. Aspirants can comment in the comment box regarding any other queries. 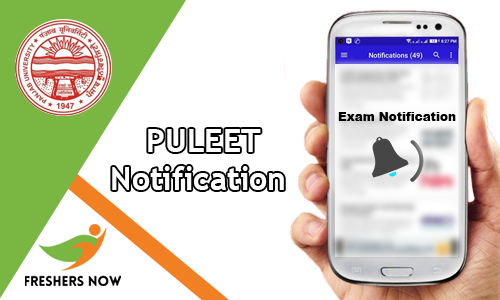 Moreover, for any other relevant updates regarding PULEET Notification 2019 keep browsing our website Freshersnow.com. Bookmark us by Ctrl + D to get all the latest updates. As of now, the details of PULEET Notification 2019 has not been announced. The information provided here about PULEET 2019 Notification is just for reference purpose only. We will update this page with the latest information once the concerned officials of the Panjab University, Chandigarh release it.